It 's hard to believe that a hurricane that pummeled Texas three days ago is once again creating chaos and havoc in the same devastated communities. To date, Hurricane Harvey has dumped over 50 inches of rain, and when Harvey finally turns into a gentle breeze with misty rain, Harvey will have blown and rained for over nine days. Unfortunately, before that happens Harvey will have flooded over 50 counties, just in Texas alone, and displaced well over 30,000 people and well over 450,000 people are expected to seek federal aid. 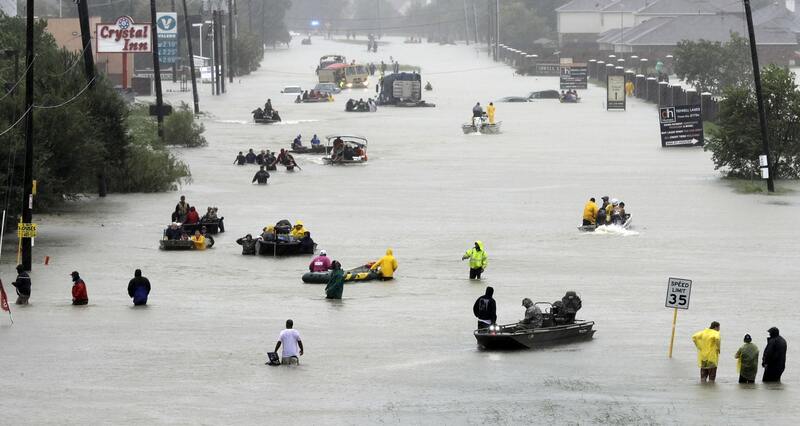 The rush of the wind and the outpouring of rain has devasted thousands of people, but there have also been hundreds if not thousands of stories of individuals serving as rushes of fresh air for those who have been overwhelmed by Harvey. For example, hundreds of civilians have launched their boats into neighborhoods going house to house to help get people to higher ground. I was impressed with one image of a little boat, pulling a giant swan inflatable. While Hurricane Harvey is certainly a story of chaos and destruction, the bigger story is how people have chosen to take an extremely negative situation and turn it into a very heart-warming positive experience. On Sunday we, of course, prayed for the residents of southeast Texas and the communities of the Gulf Coast that were impacted by Hurricane Harvey. Like millions of others who have watched this unfold, we have wondered what else we can do to make a difference in the lives of our fellow brothers and sisters? We have asked, "How can we be a rush of fresh air?" Sunday evening I asked our leadership team to begin developing a plan of action because I knew you would want to respond. Our initial response will be to partner with our disaster response agency, The United Methodist Committee on Relief. UMCOR will be able to provide immediate financial assistance. Also when the time is right, they will be launching disaster recovery teams into those heavily damaged areas. As the governor of Texas has already stated this will take years to recover. Many of you know first hand from your experiences in 2004 that recovery takes time. The beauty of UMCOR is that they are there for the long haul. Long after the Red Cross leaves to support the next diaster, UMCOR remains in the community. So an immediate response is to give to UMCOR. We anticipate the Conference also responding with sending supplies and relief kits. We will want to participate in this as well. The current plan is to get all the United Methodist Churches in Fort Pierce together to create as many relief kits as possible. We are just waiting to hear when the Conference will begin receiving kits. The reality is we can have thousands of kits made, but they still can't be delivered until the waters have receded making travel possible. So we will keep you posted. I hope you’ll join Jackie, the kids and me in contributing to support the relief efforts in partnership with UMCOR. Click here to donate online to this important work, under the "Giving Type" options, select Disaster Response. 100% of what you give will go to those in Texas and the Gulf Coast who have been impacted by Hurricane Harvey. You might also check to see if your company offers matching grants for relief efforts. As always I feel wonderfully blessed in knowing that I serve a church that is determined to make a difference. I am always amazed by your generosity, and I know that you will rise to the occasion and be a rush of fresh air for our family in Texas and the gulf coast.